As sweet, sweet summer approaches its final few weeks, we figured it’s crunch time to get in the best of our simple & fresh summer night meals. Pictured below is a super yummy but SUPER simple dish. 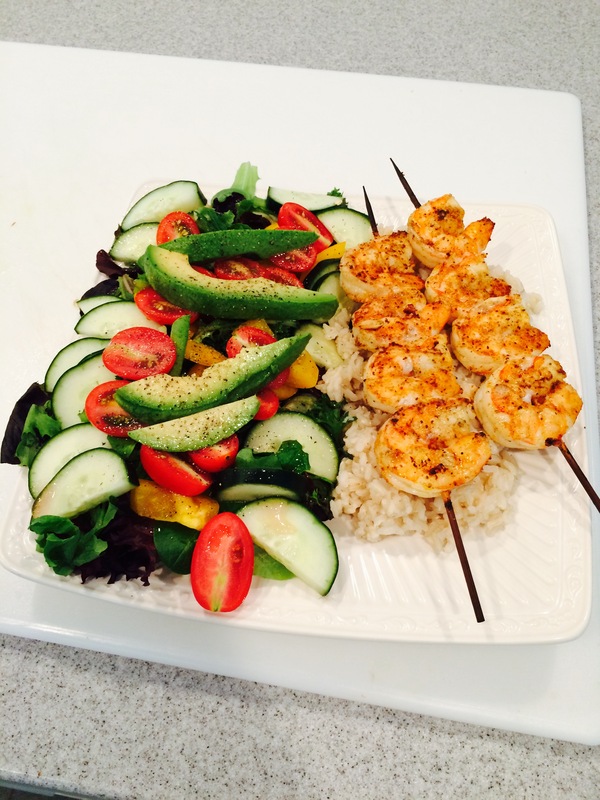 Brown rice, grilled shrimp kabobs, and a fresh mixed greens salad. In other words, BALANCE on a plate. It’s the perfect blend of starch, protein, & veggies! -Fresh or frozen wild caught shrimp (Look for the 16-20 count — the smaller count, the bigger the shrimp! 1. Peel & clean shrimp. Soak the wooden kabobs in a bowl of water for 30 min (or use the metal kind). *You don’t have to use kabobs. At school, when I use my grill plate, I just put them right on the plate. *This is a good item to prep on the weekends, too. 2. Start cooking your rice. Follow directions on the bag. *I always aim to have a full cup of grains with my meals. #CARBS (But for real, food labels aren’t aware of athlete’s nutritional needs). *Hopefully this part is already #prepped. 3. Spray the kabob with olive oil (I LOVE the olive oil PAM). Place the shrimp on the kabob, and then rub olive oil on the shrimp. Season both sides of the kabob with Old Bay. 4. Grill the kabobs for about 3 min on each side (they should be completely white). 5. Prep your salad on the side. For dressing, mix together a 3:1 ratio of olive oil & vinegar.